Today the Bureau of Labor and Statistics (BLS) reported that the unemployment rate for Post-9/11 veterans* increased from 4.7 percent in February 2016 to 6.3% in March 2016. Among all veterans, unemployment rates increased, from 4.1 percent in February 2016 to 4.5 percent in March 2016. The national employment increased from 4.9 percent in February to 5.0 percent in March. It is too soon to tell whether the 1.6 percent increase in the unemployment rate for the post-9/11 generation is a trend to be concerned about or simply a one time variation due to the small sample size of this population. It’s certainly something we’ll monitor. The BLS also released their annual report this month, the Employment Situation of Veterans 2015. 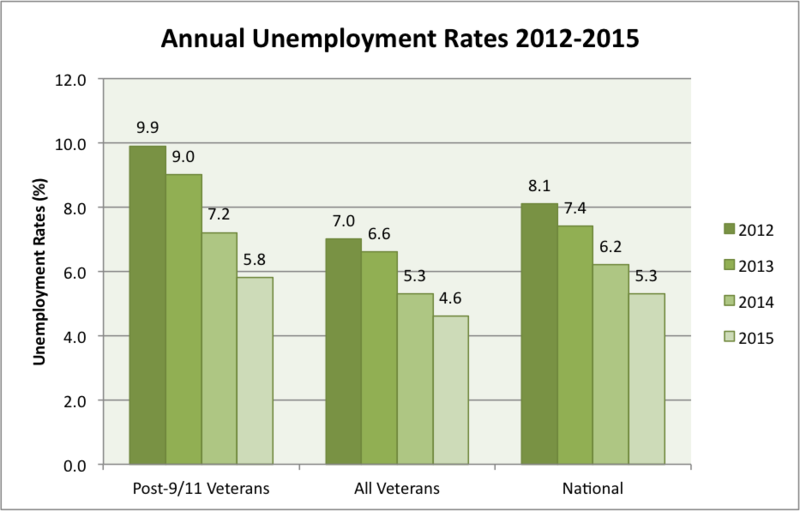 Positive trends have continued for all veterans, as unemployment rates have continued to decline. Unemployment rates for post-9/11 veterans are down significantly from 2014, and are also at their lowest point since BLS began recording data for this group. However, they still remain higher than unemployment rates for the nation as a whole. The graph below illustrates the trend in declining unemployment rates, which were 5.8 percent for post-9/11 veterans in 2015, 4.6 percent for all veterans and 5.3 percent nationally. While employment trends are positive overall, there are some groups that are still facing challenges. Women veterans face higher unemployment rates compared to their male peers, as do post-9/11 veterans and veterans who are racial and ethnic minorities. In 2015, women veterans had an average annual unemployment rate of 5.4 percent, while male veterans had an average annual unemployment rate of 4.5 percent. Among post-9/11 veterans specifically, women were unemployed at a rate of 6.4 percent, compared to 5.7 percent for men. 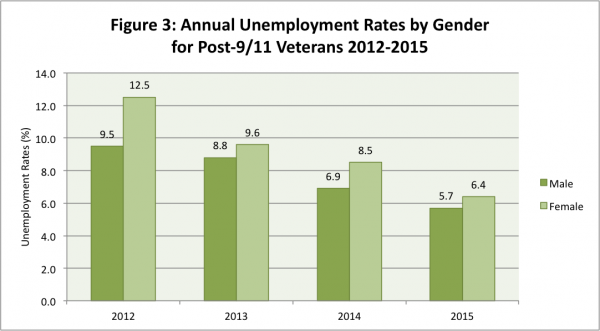 Unemployment rates for male and female post-9/11 veterans from 2012 to 2015 are shown in the figure below. While women veterans, post-9/11 veterans and veterans with disabilities face some challenges, employment trends for these groups are improving. Public and private sector employers should continue to work together to reach out to the veteran community, especially minority veteran populations, to utilize the skills and talents they have developed through military service. While the progress made by many public and private employment initiatives for veterans is encouraging, there is still much work to be done. Sustainable change requires not just jobs, but investments in long-term careers for this next generation of leaders. 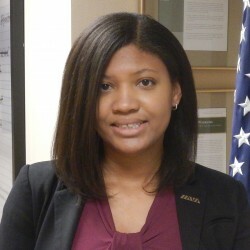 For more suggestions on employing the newest generation of veterans, please see IAVA’s 2015 Policy Agenda.